In February of 2019, districts in the Turkish cities of Ankara and Istanbul began selling produce directly to consumers at local markets in an effort to bypass retailers, who had been characterized by President Recep Tayyip Erdoǧan as “terrorizing” society for private gain. Over the course of 2018 inflation had skyrocketed as the value of the Turkish lira plummeted; the decision to set up subsidized municipal markets followed a 31 percent year-on-year surge in food prices in January 2019. In Istanbul’s Bayrampaşa district, crowds waited for an hour to purchase items selling at half the private market prices. Many were well aware that the state-run markets were a new manifestation of what are called “election economics” in Turkey—government policies of tax breaks or increasing welfare benefits just prior to elections to increase votes. The opening of the subsidized markets in early 2019 just happened to precede municipal elections scheduled for March 31. It was also clearly no accident that the urban markets were established only in Ankara and Istanbul. Residents of the nation’s two largest cities both voted “No” in a 2017 constitutional referendum to make Turkey an executive system, a blow to the apparent hegemony (if not political power—the referendum succeeded) of Erdoǧan and his Justice and Development Party (AKP). Selling basic necessities at reduced prices while lambasting the greed of individual vendors would, it was hoped, encourage enough electors to cast their votes for AKP mayoral candidates in March. The opening of the produce markets was ironic considering the government’s release of the New Economic Program, a three-year plan unveiled in September by Finance Minister (and Erdoǧan son-in-law) Berat Albayrak. Though mainstream media has emphasized the plan’s primary aims of revising exaggerated growth estimates and restoring investor confidence in Turkish markets, the Program intends to address the current economic crisis by, among other things, imposing austerity measures. Government-subsidized produce during a recession would of course hardly be in keeping with “fiscal discipline.” Perhaps unsurprisingly, in the interest of election economics the Program was shelved—until after the election, that is. Electoral tactics were not confined to the economic sphere, though for most people material concerns were foremost. 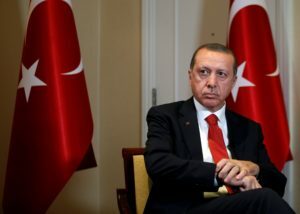 Brazen attempts by Erdoǧan to invoke a religion-inflected, neo-Ottoman nationalism included campaign speeches showing footage of the massacres of worshippers in two mosques in Christchurch, New Zealand, by a white supremacist from Australia. In addition to asserting authorities had failed to protect Muslims, Erdoǧan claimed people traveling from Australia and New Zealand to Turkey with anti-Muslim sentiments would be sent home “like their grandfathers” in the Gallipoli Campaign—a reference to the World War I battle in which over 100,000 soldiers, including approximately 9,000 Australians, were killed. Other tactics included simply accusing opponents of corruption or slandering them with the label of “terrorist” (or, more commonly, of propagandizing for terrorists). While accusing pro-Kurdish parties of supporting terrorism has been a consistently successful way for a number of Turkish governments to repress the left since the 1990s, in 2019 even members of the People’s Republican Party (CHP), the party of Mustafa Kemal and the nation’s oldest, were accused by the AKP of terrorist propaganda. The AKP’s strategy of attack failed. In Ankara, CHP nominee Mansur Yavaş overcame allegations of corruption from the AKP and won that city’s mayoral race, returning the party to power in the capital for the first time in twenty-five years. Though it was highly unlikely inhabitants of the coastal Aegean town of Izmir, Turkey’s third largest city, would elect an AKP candidate for mayor, the CHP’s Tunç Soyer defeated the AKP’s Nihat Zeybekçi by close to twenty points, a remarkable trouncing. And at the time of this writing it appears even Istanbul, a city of 18 million, will go to the CHP’s Ekrem Imamoǧlu, who defeated Binaldi Yıldırım, AKP stalwart and former prime minister. The loss of the capital city of Ankara is a major blow for the AKP; losing Istanbul would be even more demoralizing. Erdoǧan’s political career was forged in Istanbul in the Welfare Party (forerunner of the AKP) as mayor in the mid-1990s, and he has famously said that in elections “whoever wins Istanbul, wins Turkey.” For many AKP supporters, Istanbul stands as an Ottoman beacon of Islamic imperial civilization, in contrast to Ankara’s status as representative of Kemalist republicanism. Its loss to the Kemalist CHP would have tremendous symbolic significance. AKP losses were not confined to the three largest cities; the ruling party also lost control over the urban centers of Adana, Antalya, and Mersin. While hopeful assessments of the election as signaling the beginning of the AKP’s decline are therefore understandable, for the left caution is warranted. Most obviously, while in the immediate aftermath of the election Erdoǧan appeared uncharacteristically chastened, the AKP initially challenged results in Istanbul, Ankara, and in a number of other districts. Pro-government media (which is to say most media) are reporting stolen ballots hurt the ruling party—an ironic claim not lost on participants of recent elections who called for recounts and were denied. At the time of writing, the AKP has accepted the loss of Ankara, but is demanding the Supreme Election Council rule to re-run the election in Istanbul. Additionally, there is little that is radical about the CHP, and even less about the Nation Alliance which it established in 2018. Though nominally center-left, last year the CHP joined forces with the nationalist IYI (“Good”) Party to form the Nation Alliance. The IYI Party is a breakaway faction from the Nationalist Action Party (MHP), an ultra-rightwing group whose ideology is largely premised on a mythological, racist pan-Turkism. (Incidentally, Mansur Yavaș, the new CHP mayor of Ankara, spent more than two decades of his political career as a MHP member). In 2017, the MHP joined forces with the AKP to create the rightwing People’s Alliance, leading anti-AKP nationalists to leave and establish the IYI Party. The IYI Party officially describes its political orientation as nationalist, “liberal-conservative,” and secular. While “iyi” means “good” in Turkish, “IYI” also functions as an acronym for the seal of the Kayi tribe, one of the twenty-four tribes of the Turkish tribal union of Oghouzes in existence during the fourteenth-century founding of the Ottoman Empire. While presenting itself as a center-right alternative to religious conservatism, the party’s name represents one form of a recent resurgence in ultra-nationalist Turkish racism—especially prominent among youth—that hardly bodes well for left politics, let alone everyday life for Kurds, refugees, and other minorities. The political spectrum of the two main political coalitions thus ran from the centrist nationalism of the CHP to the far right nationalism of the People’s Alliance. It is also difficult to see how the CHP can use its local electoral gains to become more than the “main opposition party.” The party remains ideologically split between social democratic and nationalist factions, leading to paralysis when it comes to offering anything more than a commitment to laicism. While evoking both its origins as the nation’s founding secular party as well as its more recent turn to social democracy when expedient, in recent years it has done little more than emphasize the abuses and corruption of the AKP. As in 2015, 2017, and 2018, detentions and arrests of HDP (or BDP) members took place in the weeks before the March election. During the election campaign, at least 713 HDP administrators and members were detained; 107 were arrested. Since 2016, more than 6,000 HDP members—including co-chairs, MPs, and mayors—have been arrested. Such actions are justified by mainstream media who now openly claim the HDP is simply a front for the Kurdistan Workers’ Party (PKK). Though under serious attack, the HDP maintained its relevance. In large western cities the party didn’t field mayoral candidates; its suggestion supporters vote against the People’s Alliance translated into large numbers voting CHP. Hence pro-government media accused CHP candidates of an unstated alliance with the HDP—and therefore of support for terrorism. Without HDP votes there is no way the CHP could have won Istanbul or the southern cities of Adana and Mersin. While the party lost a number of former districts, it importantly held onto the strongholds of Diyarbakır, Van, and Mardin, and also took back 48 communities from the AKP. HDP officials have also noted election irregularities in a numbers of places, and have rightly questioned why their recount requests have been denied while those of the AKP are invariably approved. Despite the many enthusiastic representations of the election in Western mainstream media, some have pointed out that the AKP and the People’s Alliance still received the most votes. Autocrats from across the world in fact called Erdoğan to congratulate him on winning yet another election. And with parliamentary elections four years off, it will be a long while before any national electoral challenges to AKP rule can occur. For the election to be more than merely symbolic and defensive, concrete measures by municipal assemblies will need to be taken that impact people’s lives in a positive way. This could be the positive flip-side of the election being merely municipal. There is not much local democracy in Turkey; stimulating neighborhood, village, and town political participation and decision-making would be a good way to foster civic consciousness on a non-national level. Crucial to any such process will be the building of bridges between party branches with a commitment to progressive politics and social movements on the ground. The HDP encourages the formation of local assemblies and alliances with social movements; CHP mayors and assemblies might similarly promote grassroots democratic processes and interactions with civil society organizations. Whether the new mayors of Ankara and Istanbul, a lawyer and businessman, respectively, are up to the task is a very open question. Retreating to the bunker of secular Kemalism, however, is a dead-end option.